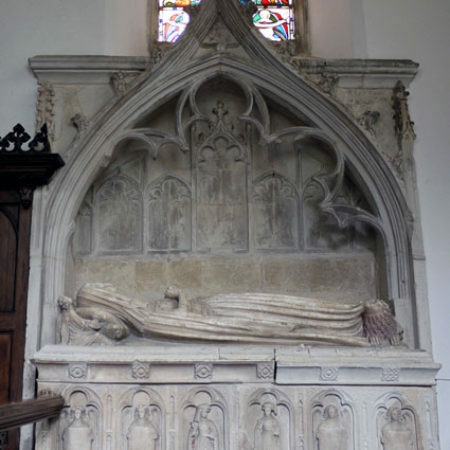 In her will, dated 1422, Elizabeth, ‘lady of Clynton’, requested ‘my body to be beryet in ϸe chauncel of haversham before ϸe ymage of oure lady Seynt Marie’. 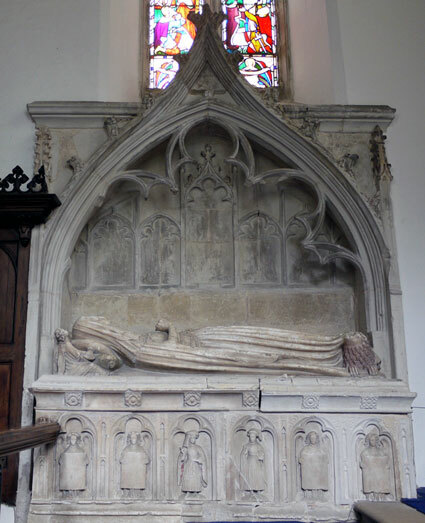 She makes no mention of a tomb monument, but one survives on the north side of the chancel of St Mary’s church at Haversham. Although there is no inscription or surviving heraldry it is of the right date to commemorate her. Lady Clinton lies recumbent with her hands held in prayer, her head resting on two pillows supported by angels and with a large lion at her feet. She is dressed in a wide-necked surcote ouverte (usually, although incorrectly, called the sideless cote hardie), close-fitting to the waist, below which it hangs in graceful folds. The large openings at the sides are bordered by a wide band decorated with a floral motif. Thorough the large openings at the sides can be seen her tight-fitting kirtle, low at the neck and girdled at the waist. From her shoulders hangs a mantle, which reaches to her feet; it is tied by tasselled cords which loop elegantly over her breast. Her neck and chin are covered by a pleated barbe and her head is covered by a kerchief which extends low over her brow and falls behind her head in folds to her shoulders. The last two features indicate that she is a widow. 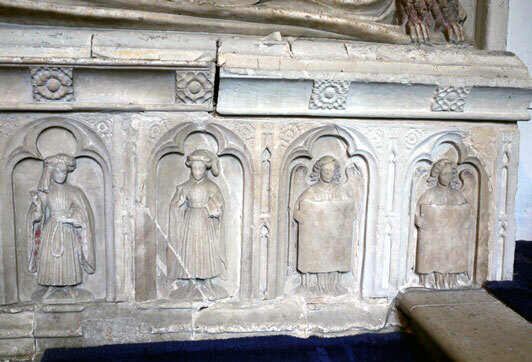 Lady Clinton rests on a tomb chest, now somewhat damaged. On the front are six panels. The first and last two have figures of angels dressed in clerical attire and holding large square shields on which arms would originally have been painted. 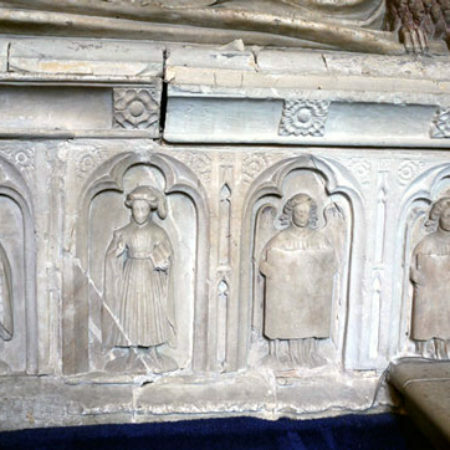 The middle two panels have male figures in fashionable dress. They wear houpelandes with high collars and long wide sleeves; the garment is held tightly by a belt, at waist level on the figure on the left and higher on the figure on the right. This distinction may have been intended to suggest that the right-hand figure died earlier and is therefore shown in dress of a slightly earlier date. The figure on the left has puffed sleeve heads and the edge of the sleeves are dagged below which can be seen the sleeves of the garment below which are full and gathered at the wrist. This more elaborate detail perhaps indicates that the person represented was of a higher status than the second figure. On their heads they wear hoods with a padded roll or bourrelet. Once again, that of the figure on the left is more elaborate. What is the significance of these figures? One carries a rosary and the other a prayer book, hence they function as mourners. The distinction between the two suggests that they were intended to represent specific men, undoubtedly kinsmen of Lady Clinton. 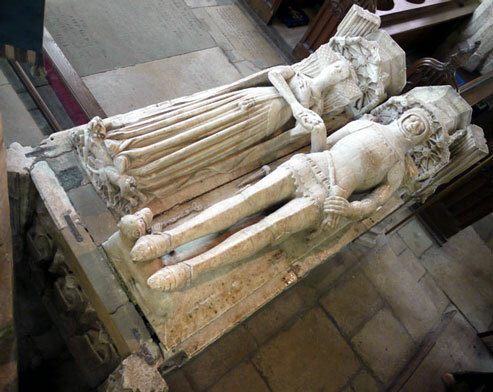 When in 1347, her father William de la Plaunk, lord of Haversham manor, died, he left two daughters Katherine and Joan, aged four and two, while Elizabeth, was born after his death. By 1361 Elizabeth was the wife of John son of Fulk de Birmingham, but this was the least prestigious of her three marriages. By 1356 Joan was dead and Katherine seems to have died without issue sometime after 1372, when a second inquisition was held as to her father’s property, and Elizabeth was seised of the whole by 1389, when she was the wife of John, Lord Clinton. He must have died within the next ten years as sometime between 24 December 1398 and 15 January 1399 Elizabeth married Sir John Russell of Strensham (Worcestershire), who died in 1405 and is commemorated by a brass in Strensham church. Elizabeth left no issue at her death in 1423, although that she had borne at least two children is indicated my directions for prayers to be said for various kinsmen including ‘my children soules’. The likelihood is thus that the two weepers represent her second and third husbands; perhaps the more elaborately dressed figure on the left represents Sir John Russell and the plainer figure on the right John, lord Clinton. 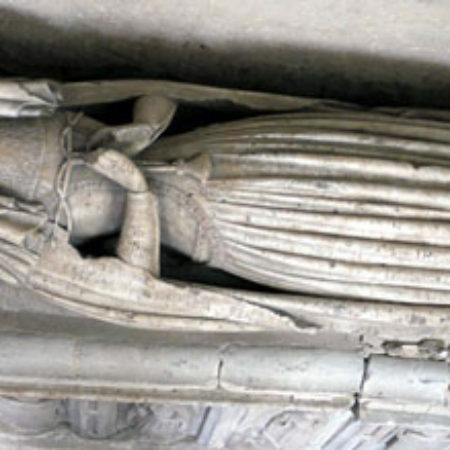 Elizabeth’s appointed seven executors to carry out her will, but had no widower or child upon whom she could rely to set up her tomb monument. It may well be that she had it made in her own lifetime. The weeper figures on the tomb chest are unusual and indicate a special commission. 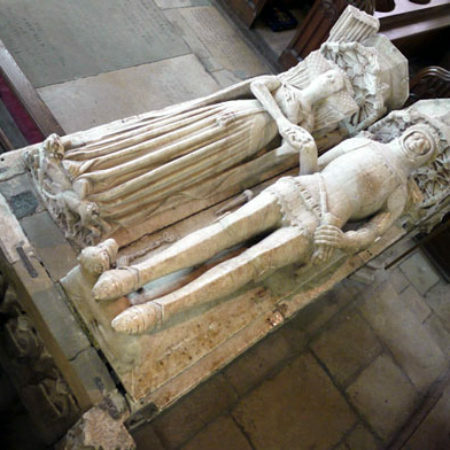 Her own effigy bears a close resemblance to that of Ralph Greene (d. 1417) and his wife Katherine at Lowick (Northamptonshire). The contract for its manufacture survives showing that it was ordered in 1419 by Katherine Greene from Thomas Prentys and Robert Sutton of Chellaston (Derbyshire). Lady Clinton’s monument is another likely product of this workshop, probably made in the closing years of her life. Fig. 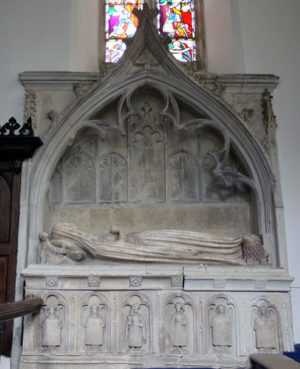 1 General view of tomb monument to Lady Clinton. Fig. 2 Lady Clinton’s effigy. Fig. 3 Detail of tomb chest figures. Fig. 4. Monument to Ralph and Katherine Greene at Lowick.